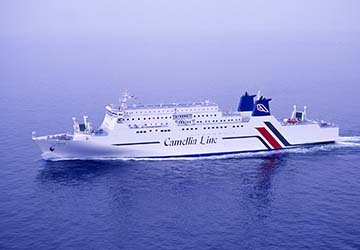 The New Camellia, the name deriving from the city flower of Busan City and Fukuoka City, provides a luxurious sailing experience between Japan and South Korea. 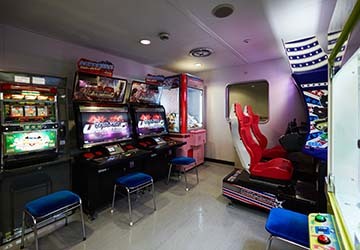 On board the New Camellia ferry you’ll find a host of amenities to keep you busy on your trip between Japan and South Korea. These include a restaurant, observatory spa bath, duty free and gift shops, a games room, vending machines, a karaoke room and much more. There’s also a large choice of on-board cabin accommodation on offer to suit all budgets which ensures you arrive fresh at your destination. The New Camellia has been described as a hotel on the sea, and with the choice of rooms, you can see why. There is a wide range of options for varying preferences and budgets. The Royal suite not only provides a luxury setting on the inside, it also comes with a private terraced balcony, showing magnificent views of the sea. In the room itself you’ll have use of en suite bathroom facilities, a TV, a walk in closet, a refrigerator and of course, luxurious bedding. The Deluxe Single and Twin rooms deliver a comfortable and urban feel with a touch of class. With a shower room, toilet, a TV, refrigerator and plush bedding you’ll be travelling style and comfort. These rooms come in both Western and Japanese style, meaning there is a room for everyone’s needs. 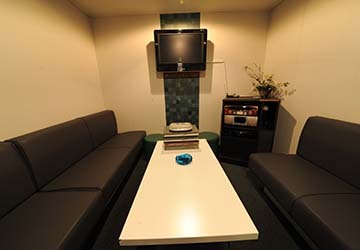 For those travelling with a family, the First Class Japanese Style Room provides is a wonderful habitable space to relax in. The First Class Western Style Rooms are ideal for small groups and the Second Class Room offers a casual and communal space in a futuristic setting. 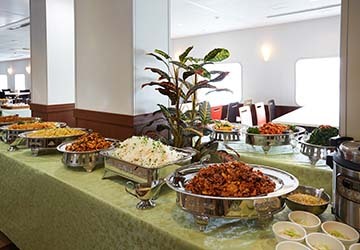 This modern ship has a great selection of food, including a great breakfast and dinner buffet service. 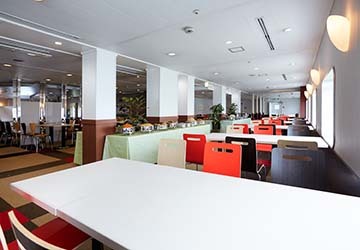 You’ll find a wide array of authentic Japanese cuisine, Korean delicacies and Western dishes in the restaurant. 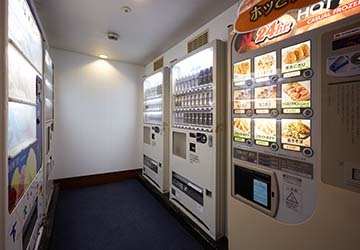 If you just fancy a quick snack or a small treat there are also a number of vending machines on board. Whether you want to buy some necessities, a souvenir for family or friends or you want to treat yourself to a present, you won’t be short of options in the Duty Free shopping and Gift Shop. 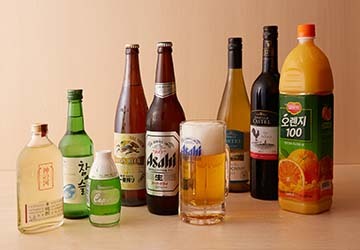 With lower than high street prices on offer you can save money on goods such as alcoholic drinks, tobacco, cosmetics, perfumes and more. The New Camellia is bursting with activities and areas to help while away the hours. Why not get your family and friends together and head to the Karaoke Room. 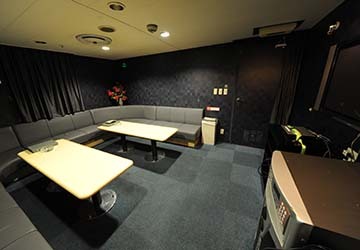 This dedicated singing space can accommodate large and small groups. There is a Games corner for the little ones and the big kids to take advantage. Here you can enjoy a range of video games, from fighting battles to racing games. If you just want to kick back and relax there is plenty to help you do just that. You can take in the stunning vistas with a walk along or seat on the Promenade Deck or you can even head to the Observatory Spa Bath. The soothing waters are the perfect way to relieve yourself of fatigue on the trip. If your journey is for work or business reasons there is the Multipurpose Hall which can be hired out for small seminar groups, meetings and training purposes. 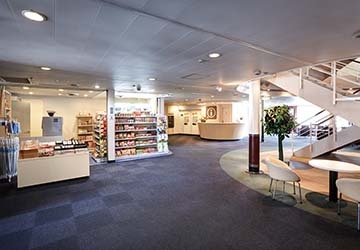 Please Note: Whilst we have taken great care in making our New Camellia guide as accurate as possible, onboard facilities, services and entertainment may vary depending on the date and time of year that you travel, facilities mentioned may change without notification and ferry companies reserve the right to operate vessels other than those mentioned at time of booking without prior notification.